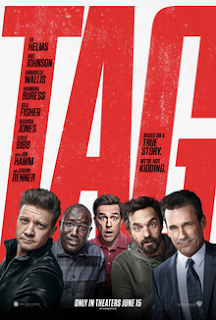 ‘TAG’ is one of those stupid comedies that dumb moviegoers seem to enjoy watching, some of them click and become big hits, like “The Hangover” and “Wedding Crashers”, some of them flop, like this one. The premise is about five friends who have been playing the game of Tag every month of May for the past 30 years or so. These are Hoagie Malloy (Ed Helms), Bob Callahan (Jon Hamm), Randy Cilliano (Jake Johnson), Kevin Sable (Hannibal Buress) and the only one who has managed to remain untouched all these years, Jerry Pierce (Jeremy Renner). Hoagie has a very enthusiastic wife who participates in their game with so much energy, Anna (Isla Fisher), and this year, a Wall Street reporter, Rebecca (Annabelle Wallis), joins them to write about it. The movie is said to be based on a true story of friends featured in the Wall Street Journal. This year, Jerry is about to get married to Susan (Leslie Bibb) and Hoagie and friends all go to the wedding hoping they can finally tag him. The four friends pull out all stops in their efforts to finally tag the elusive Jerry, risking life and limb in the process. But Jerry seems to have anticipated their every move and even gets to invite the former high school crush of Bob and Chilli, Cheryl (Rashida Jones), just to distract them. While watching all the over-the-top gags and jokes that the friends go through in the movie, we can’t help but think how assinine the whole enterprise is. There’s not even one scene that succeeded in making us laugh. The “American Pie” movies are also dumb, but not this dumb and stupid. You just want to tell all the foolish pranksters to knock some sense into their heads and to just please grow up. The movie starts with a scene showing Hoagie applying for a job as a janitor. The interviewer wonders why he’s doing so when he is a veterinarian with a Ph. D. It turns out that Hoagie’s real intention is to get into the office of a big insurance company where the boss is Bob Callahan and he wants to tag Bob. They’re that serious in this game of tag. Their reason is “We don’t stop playing because we grow old. We grow old because we stop playing.” Obviously, what they really have is serious mental health issues. At their age, they have apparently not reached a level of maturation, intellectually and emotionally, including the makers of the movie which has an incredibly nonsensical movie plot that doesn’t even respect a serious therapy session or a serious Alcoholics Anonymous meeting. No wonder it bombed in the box office when shown in the U.S. and other territories.